Niggas with guitars, Arnold Schoenberg, Laura Ingalls, Emptyset, Godspeed You Black Emperor and more. It&apos;s no secret i&apos;ve been over the idea of entertaining people with loopy dance music for a while, i would much rather torture them. And so this thursday we&apos;re trying a bit of a new formula at The Shelter here in Shanghai, playing live with a bunch of modular synths over some vintage horror movies, deejaying a bunch of music that you can only dance to with a bit of imagination. Of course it sounds challenging and not very fun, but life isn&apos;t always about loosing yourself in the common boom-boom of the House beat, sometimes it&apos;s about another experience. This short mix will give you an idea of the music you&apos;ll hear that night, some old industrial favourites, some new droney stuff, some noise, and even classical music that seems to have been completely banned from the clubs a long time ago, time to bring it back! 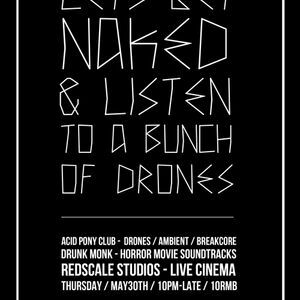 So this thursday let your mind come naked, and let&apos;s listen to a bunch of drones.